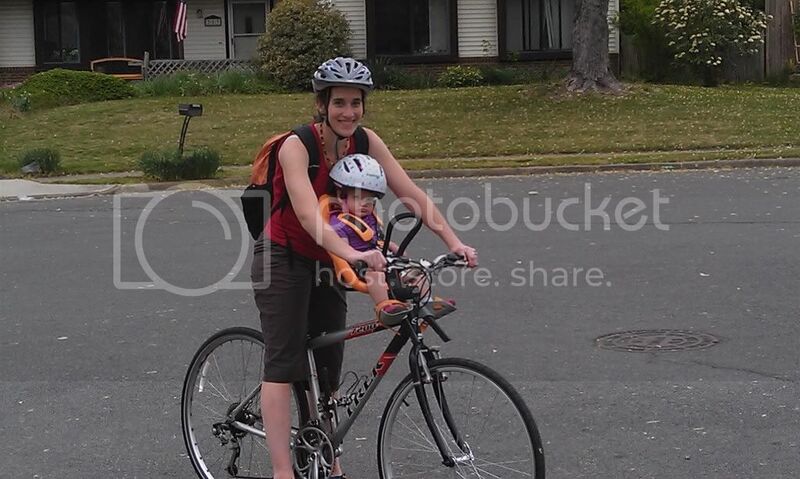 In two of my semi-recent posts, I laid out some of the choices in traveling by bike with kids, and in choosing a helmet for those pint-sized commuters. 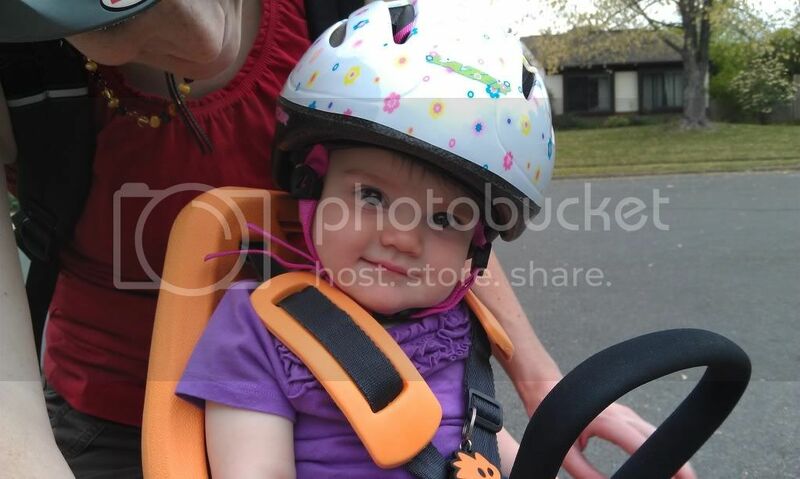 Since then, we’ve acquired both a front-mounted seat and a helmet for our youngest, R. We’re in the early stages of use still… but so far so good! First… the seat. It’s a Yepp Mini we got with our REI dividend (yeah, we shop there a bit! ), and it is the coolest bike seat I think I’ve ever seen. I’d assumed it would be plasticky, but it’s actually a pretty soft – but shape-holding – rubber texture. R thinks it’s about the coolest thing ever, and couldn’t stop grinning during our first test ride! The only bad thing about it is we don’t have a bike that it fits really well on – right now it’s on my wife’s hybrid, but she has to pedal carefully so she doesn’t bang her knees, the footrests affect her turning radius (although not terribly), and she can’t slide forward too easily when she comes to a stop. So… we’ll see how it works out. We’re huge fans of the seat itself, but not quite as big fans of how it works with us and our bikes. I’ve got my eye out for a bike it’d work better with though – I figure I can find a used city/cruiser-style bike with a friendlier geometry for less than the cost of the Yepp mini! These seats are hugely popular in Europe for use with Dutch-style bikes – but the Dutch-style bikes here come at a prohibitive price point. I’ll be reporting back in the coming months on what we end up doing! 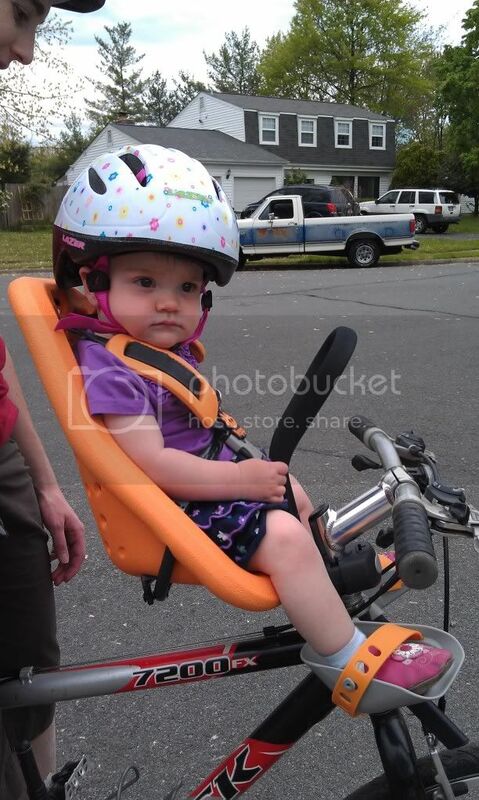 For the helmet, we went with the Lazer BOB infant helmet, and it’s working out pretty nicely. It fits R a lot better than other helmets we’ve tried, though it’s not as easily adjustable as some (you have to remove the helmet completely to adjust the straps, which is less than ideal), and… yeah, it still looks kinda huge! We’re still working on getting the fit 100% dialed (we make a small adjustment every time we put it on her), but overall we’re pretty happy with it.